I have to admit that I haven't always been into makeup. But lately I have been. I have been visiting Sephora more times lately then I ever thought I would. But my favorite eyeliner actually came to me by accident. I had entered a contest at Sofachip.com and for the prize I got some makeup too. 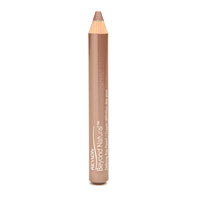 This Revlon Beyond Natural eyeliner came with it. I was really not into trying it out. I have always been so sensitive to eyeliner and actually stopped buying or wearing makeup all together because I couldn't find an eyeliner that I liked. So the first couple of times that I used Beyond Natural I was impressed. I liked how it applied like it was liquid. And it was so easy to work with. I actually could apply it fast and it looked great. Now I have been on the hunt to find it here but I can't find it anywhere. I hope that it's just not available in the States.